This multi-level resurfacing treatment is customizable for all skin types. DermaSweep utilizes the latest all natural treatment serums that are both good for you and the environment. 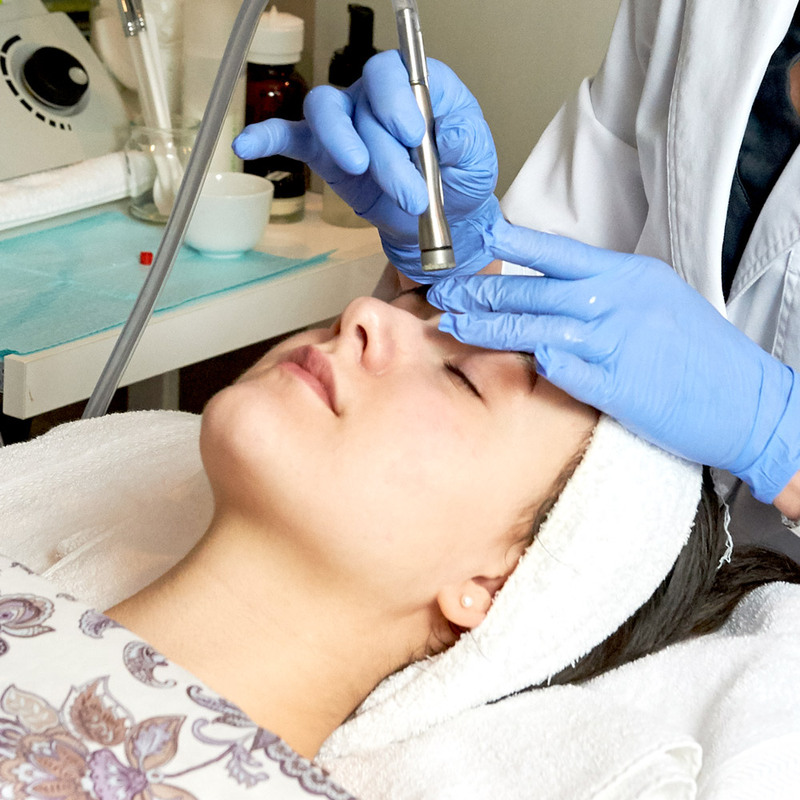 DermaSweep facials can be strong enough to treat acne scarring, discoloration, fine lines and skin laxity, or gentle enough to treat sensitive skin suffering from rosacea, dehydration and acne blemishes. DermSweep’s technology takes micro-resurfacing to the next level. Treatments begin with gentle exfoliation using nylon bristle tips that sweep away dead skin cells and blackheads and increase circulation, oxygenation and beneficial lymphatic drainage to stimulate healthier skin. Next, organic, paraben-free serums targeting specific skin care concerns are infused deep into the skin. The result is supple, firmer skin with fewer lines and wrinkles and an overall improved texture and tone. Vitamin C – Highly concentrated antioxidant, skin brightening and moisturizing for aging skin. Hyaluronic Acid – Hydrates and plumps dry, flaky skin, infused with botanicals and aloe, soothes and calms even the driest skin. Skin Brightening Vitamin C/Kojic Acid – Antioxidant rich with calming botanicals for brighter, even skin tone. ExFo – Refines and clarifies with alpha-hydroxy and beta-hydroxy acids to balance oil production and increase cellular turnover. Calming Blend – Gentle, soothing botanicals, such as chamomile, deliver a deeply soothing experience for dry, sensitive skin. Cucumber – Balances and soothes oily, sebaceous, blemished skin. Clarifying beta-hydroxy acids and soothing botanicals deliver an anti-inflammatory and anti-bacterial treatment. Our premium serums contain DNA repairing enzymes, skin transforming peptides, age reversing medical-grade growth factors, antioxidants, and skin clearing alpha-hydroxy acids. Skin is restored and noticeably improved when deeply infused with these custom compounds that effectively treat pigmentation, photo damage, early aging lines, and acneic skin. NuCell – Anti-aging rescue blend with age reversing growth factors, repairing peptides, ceramides and antioxidants. ProBio – Balances skin biome, repairs and renews with gentle brightening, exfoliating and refining ingredients. Clarify – For acneic skin. Calms, clarifies and corrects. Alpha- and beta-hydroxy acids calm and even tone and texture. Red Carpet Ready – Proprietary formulation tightens, hydrates, plumps and smoothes. Perfect skin infusion for the day before or day of an event. Illumine – Treats stubborn and difficult pigment with hydroquinone-free brighteners, antioxidants and peptides. Combining DermaSweep with enhanced peels containing powerful, scientifically proven active ingredients provides faster results than traditional peels with minimal to no downtime. Improves texture and tone of skin quickly with less peeling and flaking. Revive – A light peel for dull, sallow, photo-damaged skin. Softens fine lines and wrinkles, reduces pore appearance, and improves tone and texture. Reluminate – A superficial to light peel that brightens, refines and improves pigmentation. Combines alpha-hydroxy and TCA acids. Recommended for pigment, post-inflammatory pigmentation, acneic skin and for evening tone and texture. Refresh – A superficial peel that combines hydrating humectants, alpha-hydroxy and beta-hydroxy acids, along with TCA to refresh, balance and even texture. Great option for first-timers. Safe for dry, fragile and sensitive skin.